For the year ending August 2016 new build prices rose, on average, by 6.0%. Although this shows an increase on the previous three months, this increase has actually narrowed when compared to the same period to year ending August 2015 and is now 0.5% below the national average seen last year. In terms of first time buyers, LSL Land & New Homes First Time Buyers HPE Index looks at the average cost of buying a 70 sq m 2 bed home in each region. It compares the property price with the gross average earnings of a full time employee in that region. On average a 70 sq m home costs the equivalent of 4 years and 4 months gross earnings, which is an improvement on the five and a half years previously reported. There remains a wide regional variation in this figure, but only London and the South East require earnings above five years. A new starter home on an average salary is most easily afforded in the North East, Yorkshire & the Humber regions. 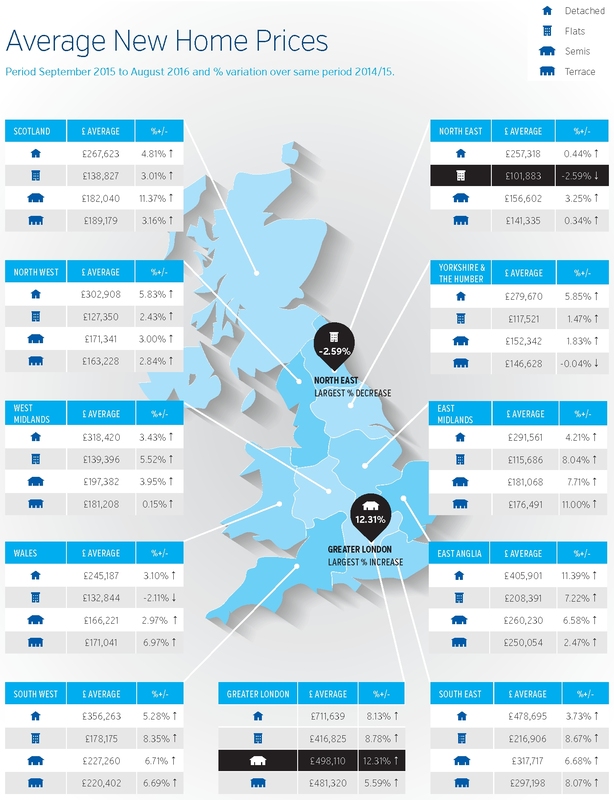 The South East, East Anglia and the South West are relatively expensive but are showing strong house price growth. Even allowing for higher average earnings, the HPE ratio for Greater London is twice the regional average rate.